The UNCG Spartans (35-22) defeated the Furman Paladins 13-1 in the Southern Conference Championship Sunday afternoon. 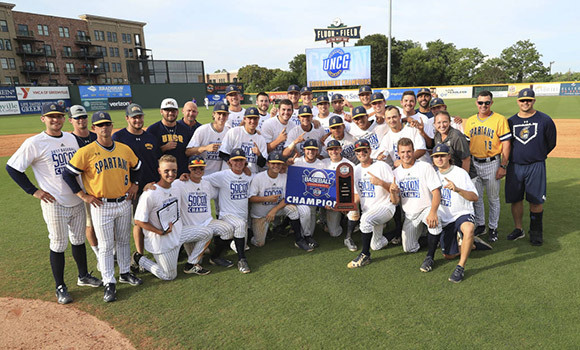 The UNCG baseball team is heading to the NCAA Tournament for the first time since 1997 after earning its first-ever Southern Conference Tournament Title. The Spartans (35-22) defeated the Furman Paladins 13-1 in the SoCon Championship Sunday afternoon to round out what has been a thrilling run for Head Coach Link Jarrett’s team. The road to Omaha begins this Friday when UNCG travels to Clemson, South Carolina, to take on the Clemson Tigers. The four-team Clemson Regional is a double elimination tournament. All games will be broadcast on ESPN3 or the ESPN app, and tickets are available for purchase here. Baseball is the third UNCG team to win a conference or regular season title this year. Men’s basketball took a share of the regular season SoCon title in February, and UNCG softball defeated East Tennessee State earlier this month to win a share of the regular season. Both men’s basketball and softball were top-seeds in their respective conference tournaments. To stay up-to-date on UNCG baseball, visit uncgspartans.com and follow UNCG Athletics on Facebook and Twitter.